Check out this elegant jacket made by Roberta at Treadle. Roberta used one of the lovely Japanese double gauze fabrics, which gives the garment a lovely drape that works well with the flowing, unstructured style. Because the fabric is double-sided, the inside of this unlined garment has the same print in negative; that plus a tidy seam finish means this closure-free jacket still looks good when the inside shows with the wearer's movement. The pattern is Vogue 8088, a Marcy Tilton design which has recently been discontinued, though it's currently still available at Marcy's website. We just got this new collection of fabrics from artist and designer Lotta Jansdotter. Born in Sweden and currently living and working in New York, Lotta's style is clean, fresh, and modern, with her Scandinavian roots and her background in printmaking evident in the bold shapes and lines of her designs. Each of these prints uses only a single color, or sometimes two, combined with a judicious use of white that places emphasis on both the bright hue and the negative space. The limited palette is striking; the aesthetic both whimsical and spare. These little birds are only about 1/2" in size. When viewed from a distance, they blend into an allover effect of tiny dots and lines of color. The use of neutral grey softens the brights, allowing them to harmonize more easily with the white. The fabrics are all mid-weight cotton, suitable for simple garments, quilts, and crafts. Any of them would be equally effective as a bold, modern dress or a couple of simple throw pillows. Our last kids' class of the summer finished up last Friday. This advanced beginning class was for young people ages 9-13 who had some sewing experience, and wanted to try projects that were a bit more complex. The three very talented girls in the class let me peek in and take a few photos of what they were up to. Maya made a dress, an bright apron, and a pleated skirt. Black and white prints go with everything! Here's Anna busy at her machine. And her nearly finished top. The waist tie and elasticized neckline keep fitting simple, and the ribbon trim makes it pop! Anella worked on crafty projects, making herself a cute and practical lunch bag and a reversible oven mitt. I believe she also made the rick-rack trimmed tunic she's wearing. We just got a few more pieces of cotton lawn in Robert Kaufman's London Calling prints. This Art Nouveau-style floral print is now available in three colorways. We've added the lavender and the bright orange/pink and re-stocked the soft orange. We also got the lovely paisley design in pink. 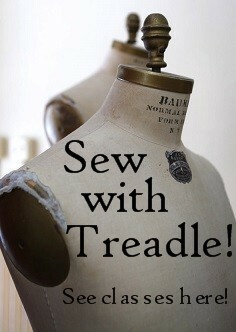 Fresh and exciting at Treadle! "Oh Deer!" by Moda fabrics. Featuring birds, dots, and of course, deer, this group has a bright, fresh pop of color, with a warm brown neutral element that grounds the colors and could allow them to blend more easily with other fabrics. Some of these fabrics are quilt-weight cotton, and some are heavier cotton twill. The group also includes these whimsical mod prints. The landscape of trees, flowers, and deer is just delectable. This would make a wonderful quilt back or a fun, full skirt. A beautiful group of linen/cotton blend prints has recently been marked down. These are 40% off while they last! There's still time to make a sweet summer dress that can take you into autumn with a little layering. I find these butterflies hard to resist! I love the sweet vintage look of this soft fabric alphabet book. It's made from a project panel intended to be sewn into a book, but you could easily use the printed panels on their own in a quilt. There are several coordinates to go with it, including this postage stamp panel. The book panel even comes with instructions! Right now at Treadle, we are fortunate to be displaying this beautiful tailored ensemble made by Paula DeGrand. Paula is a longtime customer at Treadle, and her suit is currently featured in the Reader's Closet section of Threads magazine. We at Treadle were all impressed with her fine construction techniques, such as bound buttonholes, and her fun choice of lining that adds a bright pop to the interior. Paula used this smart vintage pattern for her jacket. Vintage patterns are unique and often beautiful, but can be challenging to work with due to non-standard techniques or lack of instructions. One way to inject a little vintage flair into your sewing without relying completely on an authentic vintage pattern is to borrow details from one and use them on a modern pattern. A lapel shape, pockets, peplums, or seam placement can be drafted into your modern pattern. This pleat detail from Paula's jacket is a perfect example. Though she used the pattern almost entirely as-is, it would be easy to copy just this single detail onto a modern jacket. The patterns is McCall's 6322. She combined a mod floral print with two colors of coordinating shot cotton and some large rick-rack at the waist. Shot cotton is a great choice to coordinate with prints because it's woven with two colors, giving it a subtly iridescent look that blends well with many colors. Knit fabrics have been in demand all summer at Treadle. One of the most popular is this collection of ruffled knits in several colors. Lightweight, fluttery ruffles lie in rows on an almost sheer plain jersey base. The base is a slightly darker shade than the ruffles, which adds a little contrast to the ruffles and helps to set off their movement. This fabric would make a fun skirt or dress or could be toned down a bit by combining it with a plain fabric in a garment. We recently got a new shipment of beautiful Japanese imports, including these wonderful, soft knits. Are these shapes meant to be be clouds, snow, or popcorn? (My vote's on popcorn.) The possibility of these being birds also came up, which would make sense, since this fabric is called "peaceful cooing." There is also a new group of prints in the Japanese group, mostly small-scale, scattered motifs on solid, neutral backgrounds, though the owls and bears are larger-scale. There are more new fabrics in this group than there’s room here to show, so come in and see them for yourself.